Creative agency, business of any kind, online store, designer, architect, photographer, freelancer, blogger etc. 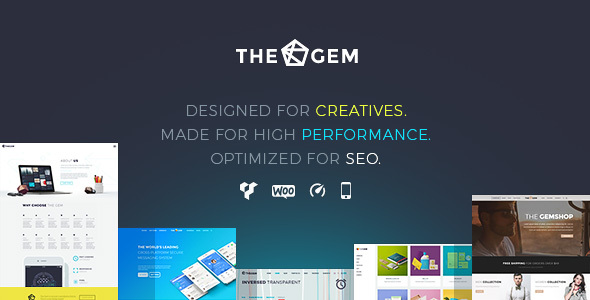 – TheGem delivers everything to cover your ambitions & creative needs! Grab this theme now and start building the website of your dreams! Just take a look at our demos and you will know why. Its design is impressive. Its features and options are overwhelming. And well-balanced. There is nothing unnecessary and odd here – each and every design, style, layout and feature are well thought out, basing on our five years experience in building multi-purpose wordpress themes. To give you the maximum of creative freedom in the easiest usage way ever. Designed in collaboration with the star designers from behance network, this design is based on thorough analysis of 2016 webdesigns by UX Pin. This theme reflects all modern trends of UI / UX design in the unique way, free of annoing mainstream approaches. TheGem is an absolutely fresh design experience, aimed to fulfill both understated and crazy ideas in minimalistic or excessive way. You are creator and you have your vision – let TheGem do the rest.